Beach volleyballs are specifically designed for outdoor use. As time passes technology has made outdoor balls look and feel more and more like indoor balls. Playing in the sand requires all the speed and agility you can get. Jump higher and move faster with our sand socks designed for beach volleyball, sand soccer and other beach sports. Protect your feet from cold, hot, or rocky sand. 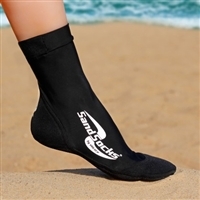 Show off your style in comfort with the best volleyball sand socks in Texas. As beach volleyball continues to gain popularity in Texas and around the globe, beach volleyball gear in San Antonio has a higher demand. We strive to provide the best equipment online and in our store, including volleyball beach socks in Texas, beach volleyballs and sand socks. Volleyball and More has the beach volleyball gear for you.